Offering multiple perspectives from many fields of human inquiry that may move all of us toward a more integrated understanding of who we are as conscious beings. Efforts to understand how the brain functions range from the molecular to the absurd, and everything in between. Increasingly, neuroscientists are looking at networks composed of various brain "modules" that, together, are responsible for many of the higher order functions researchers had previously sought in a single brain structure. This article from QUANTA Magazine, via WIRED, offers an excellent overview of what researchers know about the "rich club" network, so named because it functions like a group of well-connected individuals. This is really interesting stuff in understand how the brain is networked in a complicated system of connections. To successfully send a text message, your brain has to compose the wording and coordinate the deft tapping of your thumbs while checking for typos. Solving a simple algebra problem involves the visual cortex — to process the symbols — and the parts of the brain used for computation and short-term memory. And driving, best performed without texting, requires a combination of visual, tactile and spatial data. How do different areas of the brain communicate and coordinate their efforts to complete these tasks? Neuroscientists have long struggled to understand the brain’s ability to synthesize a dog’s breakfast of sensory inputs and cognitive processes. But a growing body of evidence suggests that a network of highly interlinked brain regions exists that could prove essential in facilitating higher-order tasks. This collection of highly connected hubs has been dubbed the “rich club” network because it resembles groups of well-connected individuals, such as Ivy League alumni organizations, that help others meet and exchange information. Within the brain, researchers “think that rich clubs have a key role to play in making global communication efficient and are also important for supporting integration of information,” said Olaf Sporns, a computational neuroscientist at Indiana University in Bloomington. Sporns first described the rich club in the brain, along with collaborator Martijn van den Heuvel, a neuroscientist at the Brain Center Rudolf Magnus in the Netherlands. Sporns and others hope that studying the rich club will help solve one of the biggest challenges in neuroscience: linking the brain’s structure with its function. While each can be measured using different technologies, attempts to reconcile structural and functional information have proven elusive. “It’s absolutely relevant to know as much as we can about the topology of the underlying structure to understand the function,” said Gustavo Deco, a neuroscientist at Universitat Pompeu Fabra in Barcelona, Spain. One reason scientists are drawn to the neural rich club network is that it seems to violate one of the brain’s organizing principles — to minimize the cost of wiring. The brain appears to favor short connections that transfer messages quickly and take up little of the brain’s valuable volume and wiring material. The wiring diagram of the microscopic worm C. elegans follows this rule quite closely. And in mammalian brains, short connections are much more common than long ones. But in both worms and humans, the rich club network is a rare and expensive exception, suggesting an important role in neural function. In the brain, the rich club is similar to the highway system, which accounts for only a small percentage of surface roads but a much larger percentage of all travel. The neural rich club makes up “a small piece of the overall wiring length of the brain, but it carries a massive amount of information flow,” van den Heuvel said. The connections between rich club hubs are anatomically long but topologically short, meaning one node is connected to any other by only one or two intermediate nodes. Van den Heuvel said this could allow faster and less noisy communication among neurons. Sporns and van den Heuvel originally defined the rich club by analyzing anatomical data gathered from images of the brain’s white matter. 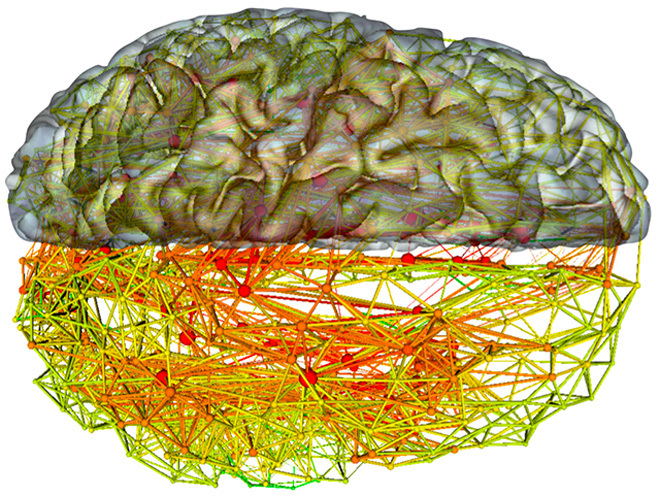 On a computer, they divided the brain into different regions and represented it as a network, with each region as a node and the neural connections as links between them. Using a mathematical approach called graph theory to analyze the properties of the network, they identified 12 highly interconnected hubs, which they dubbed the rich club. This central network was more interconnected than the rest of the brain and linked to almost every other brain region. Computer simulations revealed that damage to the rich club disrupted the overall network more than damage to other areas did. 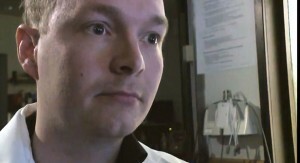 Martijn van den Heuvel of the Brain Center Rudolf Magnus. One big question that arose from the study is how the rich club network, based on anatomical data, corresponds to brain function. The scientists were particularly interested to find out whether the rich club corresponded to so-called functional networks, which have been mapped out using data from functional brain imaging. Scientists look for correlated patterns of brain activity when an individual is at rest or doing a specific cognitive task. Despite myriad studies on these functional networks, researchers have not yet defined the underlying physical structures. Sporns and van den Heuvel set out to examine the link between structure and function with one of the biggest studies to date comparing both structural and functional imaging data from the same individuals. The results, published in the Journal of Neuroscience in September, show that the rich club network in the human brain overlaps many of the functional networks that have been mapped to date. Van den Heuvel said the findings suggest there isn’t a simple linear relationship between structure and function. Instead, “the anatomy simply defines the boundaries in which functional configurations of the brain can take place,” he said. For example, when someone rapidly changes tasks, say from reading email to answering the phone, the brain rapidly switches functional states, which could be constrained by the rich club network. The findings are important because they provide evidence that may “tell us places to look in the brain that are more likely to be sites of real interest, places where when something happens, it could have a more devastating consequence to brain function,” said Michael Hawrylycz, director of the Modeling, Analysis, and Theory Group at the Allen Institute for Brain Science in Seattle. Losing a major airport hub like O’Hare in Chicago, for example, would have a greater overall impact on the air traffic system than the closing of Hector International Airport in Fargo, N.D.
A second study, published earlier this year by Bullmore and collaborators, took a different tack at linking the rich club to functional networks. Researchers compiled brain activity data from more than 1,200 people performing a variety of tasks. Bullmore said the rich club nodes were more likely to be involved in higher-order cognitive functions such as action and cognition. “It adds another piece of data in support of the general argument that the rich club is expensive because it’s functionally valuable,” he said. In April, Bullmore and collaborators published an analysis of a rich club in the microscopic roundworm C. elegans, the popular model organism whose entire set of neuronal connections, called a connectome, have been mapped out. “It’s as close to a canonical gold standard wiring diagram that we have in neuroscience so far,” Bullmore said. After identifying 11 neurons that belonged to the rich club in C. elegans, the researchers discovered remarkable similarities in the rich club of the human brain, Bullmore said. Each neuron in C. elegans has a catalogued time of birth and function, enabling researchers to explore both how the rich club develops and what it does. Like other network studies of the brain, Bullmore’s team used graph theory to map out the rich club. “It turned out that the neurons we identified by this purely mathematical analysis are known as command interneurons, which play a role in coordinated movement of the nervous system,” Bullmore said. The worms can’t move until the rich club is fully developed. Though not as complete as the C. elegans diagram, a wiring map of the much more complex cat cortex was created in 1995. One of the benefits of studying the cat brain, said van den Heuvel, is that scientists have extensive data from physiological experiments on the function of specific brain regions. In a new analysis of the cat’s connectome data, van den Heuvel and his graduate student Marcel de Reus found that the rich club network helps link the major functional networks — visual, auditory, somatomotor and frontolimbic — that had been defined in the cat brain. Indeed, 90 percent of the messages passed among these regions appear to go through the rich club. Their results were published in the Journal of Neuroscience in August. In the cat, scientists also know the direction in which neurons in one node send information to another. “That allows you to map the theoretical information flow between regions in the cat cortex,” van den Heuvel said. The rich club has more reciprocal connections, meaning nodes that send information in both directions, than other networks. “Maybe that creates an infrastructure with a high level of flexibility rather than a network of segregated modules,” van den Heuvel said. More research is needed to explore whether this structure is indeed more flexible. The fact that scientists have identified rich club networks in people, cats, worms and other species suggests that it’s a basic feature of the brain. “Maybe the rich club is a general feature of how neural systems grow,” van den Heuvel said. The variety of animals with rich club networks also suggests that the network isn’t an artifact of human brain imaging — a concern raised by critics. Although scientists can use brain imaging data to create detailed images of the human brain, these pictures are indirect — the structural maps used to analyze the rich club use the diffusion of water molecules as a proxy for neural wiring, for example — and therefore subject to experimental biases. (Diffusion maps may be better at detecting some kinds of wiring than others.) “We don’t have a perfect measure of brain structure or function in humans, so there is always a question in my mind: To what extent are the network properties we see in human imaging studies really there?” Bullmore said. The use of more direct anatomical tracing techniques in studies of other animals, however, has been consistent with the findings in humans. Rich clubs have been discovered in many interconnected systems, including the Internet, social networks and flight patterns. One recent study found that a group of college students who started interacting intensely during the first week of class and continued to exchange information throughout the semester — mostly with each other — performed better than others in the class. These students had, without realizing it, formed a rich club and reaped its benefits. But what happens when the brain’s rich club network is defective? Although the answer is still unclear, preliminary evidence suggests a connection between abnormalities in the rich club and neurodevelopmental disorders like schizophrenia, for which reproducible flaws in the brain have been difficult to pinpoint using standard brain imaging. “Despite the fact that it’s so devastating, what’s actually different in the brain of a person with schizophrenia is a much more subtle question,” Sporns said. Looking for defects in the rich club and examining other network measures, such as the number and structure of connections, is showing early promise in illuminating the disorder. 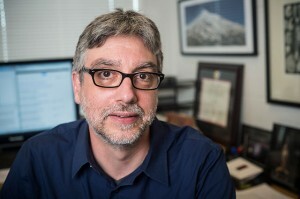 According to research published in JAMA Psychiatry in August, Sporns and van den Heuvel found that people with schizophrenia tend to have thinner and less well-developed connections between hub regions than people without the disorder, but their connections linking peripheral nodes were less defective or unimpaired. In a separate study, by comparison, people with the motor disorder amyotrophic lateral sclerosis showed differences in connectivity of the motor network. The researchers are now looking at the rich club network in people with Alzheimer’s disease. “Since the rich club is high cost and high value, it’s likely to be particularly vulnerable to disease,” said Bullmore, whose team is now studying the growth of the rich club in nervous systems and the pathological implications when it’s disturbed. However, more work is needed to understand the link between damage to the rich club and disease. For example, it’s not clear whether the thinner connections cause the disorder or are a product of having schizophrenia. Eventually, scientists should be able to disrupt the rich club network in model organisms, such as rodents, flies or worms, and measure whether the animals suffer schizophrenia-like impairments. Beyond studying the rich club’s role in disease, Sporns and collaborators hope to better define how the network varies among people. Part of their effort will focus on data from the Human Connectome Project, an effort to map neural connections and activity from more than 1,000 people and make that data publicly available. Sporns said the researchers are trying to answer questions such as whether there are heritable differences in the rich club structure and whether these structures change over a person’s lifetime. Despite the growing popularity of graph theory and other approaches for analyzing networks in the brain, it has its detractors. One of the major criticisms is its simplicity. Graph theory methods “are merely descriptive statistics that ignore our prior biological knowledge, which is substantial,” Partha Mitra, a neuroscientist at Cold Spring Harbor Laboratory on Long Island, said in an email. The analysis also depends highly on the quality of the data. Incomplete or faulty data can lead to faulty network structures. Original story reprinted with permission from Quanta Magazine, an editorially independent division of SimonsFoundation.org whose mission is to enhance public understanding of science by covering research developments and trends in mathematics and the physical and life sciences. Omnivore - Can You Have Religion Without God? What I'm Reading . . .